17-year-old young boy Sam Berns, an inspirational teen for having an extremely positive outlook towards life, died on Friday evening on January 10. Sam was suffering from Progeria, a rarest of rare genetic disease that accelerates early aging and causes premature death. Progeria attacks one in every 4 million to 8 million children who live an average life of 13 years. At 22 months, he was diagnosed with the disease and his parents, Drs. Leslie Gordon and Scott Berns back in 1999 founded ‘The Progeria Research Foundation’ to better understand the grounds of it and find treatment and cure. 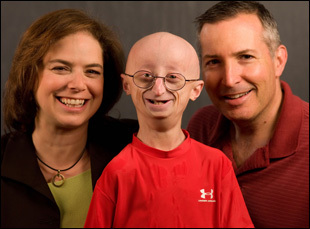 Progeria children also suffer from a loss of body fat and hair as they grow old so rapidly. They are also likely to developing osteoporosis, another ailment where bones become so fragile and are quite likely to fracture. Despite of all obstacles and struggles, he has wonderfully managed to be positive about his life, and let the harshest truth of life ‘that he weighed of 50 pounds or he had limited days in his hand with progeria’ overwhelm him or dishearten him. As a student of Foxborough High School, he joined the marching band, played a specially designed snare drum and attended his school’s homecoming dance. It was his dream that he lived with head high without staring at anybody for sympathy. “The main point is I don’t like wasting my energy feeling bad for myself. Rather I prefer surrounding myself with people I want to be with and enjoy their company and keep moving forward.” Berns once said. His courage and spirit to live the days left in his life touched the heart of millions and in 2013, HBO Documentaries filmed his story based on his life and his perception and experience of life. In 2013, he shared the philosophy of life and happiness at TEDxMidAtlantic. Sam Berns was a warrior who stole all the joy of life beating the toughest reality – ‘death.’ Sometimes life plays such a gruesome and horrible game which puzzles us on how to react and respond and whom to blame or what to do to live a meaningful life. Death is the destination we can’t escape but we all desire to live a wonderful life and steal some magnificent moments before leaving this WORLD. Now think about a person who is not only convinced of the fact that he is here to die soon ever since he gained conscience about his being and yet he consistently convinces his parents, relatives and friends to accept the fact. He kept emphasizing on living a happy life and finding happiness in obstacles, and struggles. Circumstances can be unreasonable, insanely wicked or weird but love it anyway, there can be times you find yourself broken, left ignored, betrayed and hurt but live it anyway and let yourself sit in silence and let the sweetness sealed in happiness wrap you. Taste it and experience how it feels. It’s certain that your temperament or disposition creates anxious circumstances that determine your unhappiness, whereas you can find your happiness anywhere and anytime. Find it.